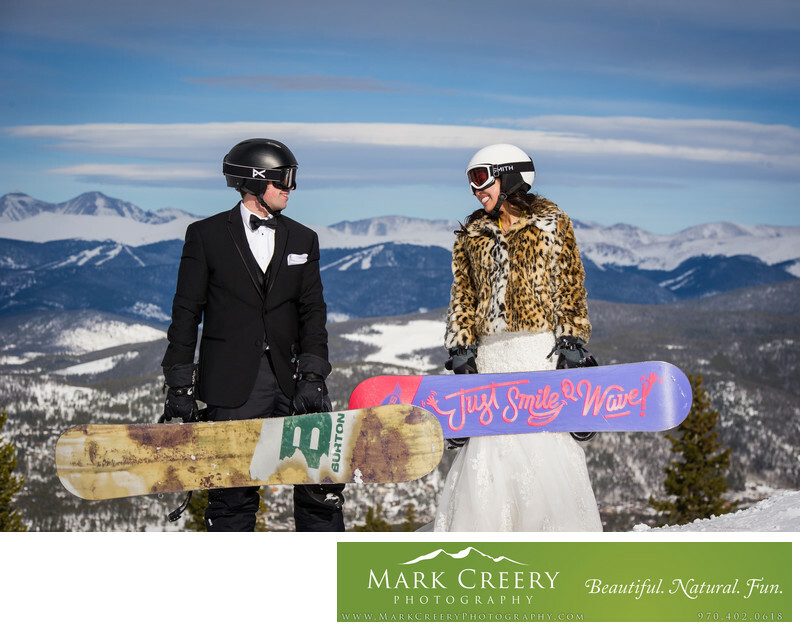 What better way to enjoy being married, then to hit the slopes right after your ceremony!? These two did just that, getting married at Sapphire Point in an intimate wedding ceremony with close family and friends in the morning, and then taking off with just me to document their snowboarding adventures on the slopes of Breckenridge Ski Resort in the beautiful mountains of Colorado. This wedding photo was taken half way up the mountain before they did some more shredding. There were lots of well wishes from onlookers as the bride shredded the slopes with the dress train flowing behind her. The cheetah print shrug also helped catch people's eyes. We had lots of fun, and then the couple rejoined their guests for their reception dinner. Location: Breckenridge Ski Resort, Colorado.